Will President Donald Trump say “Wall” or “Huge” more times during Tuesday’s State of the Union? Will Trump finally come up with a nickname for Nancy Pelosi? No one knows for sure, but one thing is certain: You can bet on these political props and more ahead of tonight’s address. At 9:00 p.m. ET, President Trump will deliver his State of the Union address on funding the border wall, an issue that caused the recent partial government shutdown. All sides have until Feb. 15 before another shutdown would go into effect. Trump has stated that should another shutdown happen, he will consider declaring a national emergency to allocate funding a wall along the southern border with Mexico—a move that will surely be challenged by the opposition in court. 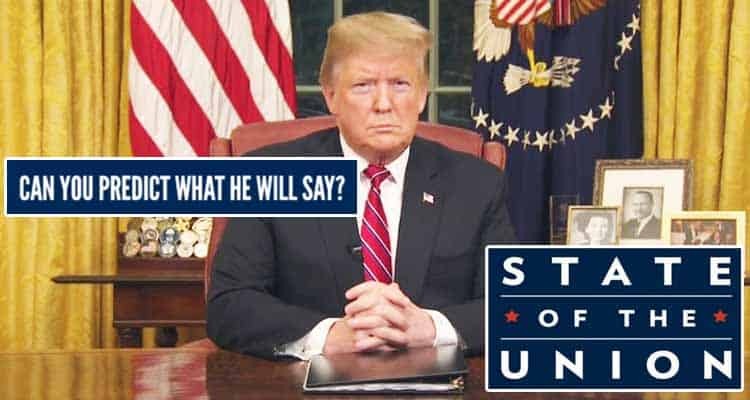 Below are the political prop bets available for the Feb. 5, 2019 State of the Union address by President Trump with the odds provided by Bovada Sportsbook.